For over a decade, Service Dogs by Warren Retrievers, a 501c3 non-profit organization, has been breeding, training and providing service dogs to people with “invisible disabilities” such as diabetes, autism, seizure and PTSD. Our mission is to provide as many high-quality bred and well-trained service dogs as needs demand. Our organization has placed approximately 600 service dogs throughout the United States and our first priority is to achieve complete customer satisfaction with all service dogs placed. Service Dogs by Warren Retrievers, “SDWR,” offers a 100% guarantee on the abilities of the dogs it places. Our success is measured through the contact we keep with the receiving families. We continue to train and monitor the success of our dogs for almost two years after initial placement. The Organization’s second priority is to be able to keep the cost of a dog for families as low as possible. To do that, we rely heavily on donations from corporations, foundations and individuals….like you. 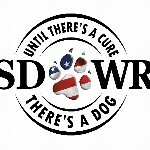 Please visit our website www.sdwr.org to contribute to our Paws for Patriots program. Your gift, which is 100% tax deductible, will be targeted to help active and retired military veterans seeking to bring a service dog into their life or the life of a family member. Help us give back to those who have given so much. Click on this link: http://sdwr.donordrive.com/campaign/P4P to make your tax deductible contribution today! Your gift will be targeted towards the campaigns of active and retired military families. You may also send a check directly to us at SDWR, P O Box 647, Madison, VA 22727 – please note on the check that this is a Paws for Patriots contribution. According to the Center for Disease Control and Juvenile Diabetes Research Foundation, 1.25M Americans have Type 1 Diabetes, of which 200,000 are children under the age of 20. Alert to high and low blood glucose levels. Retrieve diabetic life-saving essentials such as glucose, glucagon, test meters, or juice. Trained to dial 911 on a K9 phone if “their person” is unresponsive. According to the CDC about 1 out of every 88 children in the United States currently has autism. Help to keep “their person” focused by acting as a stabilizing tool. Trained to keep “their person” safe from self-injury by blocking dangerous movements. Help “their person” achieve a functional quality of life through the feelings of independence and security provided by the dog. Trained to be docile and compliant to help soothe “their person” during a period of emotional overload. According to the National Seizure Disorder Foundation 48 out of 100,000 people will suffer with long-term seizure disorders and 1 in 26 people will have recurrent seizures in their lifetime. Help “their person” rise after a seizure. Trained to dial 911 on a K9 phone if “their person” remains unresponsive. Trained to help “their person” with mobility issues they often face. Though we cannot guarantee, when with their person for a period of time, seizure service dogs have shown an ability to predict an impending seizure. According to the National Institutes of Health and Department of Veteran Affairs, 1 in 3 deployed military personnel have returned and been diagnosed with PTSD serious enough to require long-term treatment. Help with medication reminders and with other memory issues such as disorientation, directional challenges, and keeping track of time. Retrieve items such as drinks for taking medications or to alleviate dry mouth syndrome. Trained to respond to sounds such as doorbells, smoke alarms, or other noises. Provide relief from emotional overload and caring for the service dog offers consistency in a daily routine, which can lead to increased independence. Act as a buffer against apathy, low mental energy and unwanted attention in public places. Because we know every case is different, the SDWR program is specifically tailored for each client’s unique needs. We listen to what our clients tell us and we create a program that targets their primary concerns. Our goal is to provide peace of mind to all those managing an invisible disease and their families.